Want to download Lynda videos for free without having a membership? Then you are in the right place. Because today I’m going to show you the exact approaches to save Lynda videos on PC, Mac, Android & iPhone devices. The best part is that all these methods still work well in 2018. And below are the tactics that you’ll learn about in this article. It’s no secret that Lynda is an organization which provides all kinds of courses, classes, training & tutorials for various needs, such as software development, business strategy & design technique etc. But you do not have access to these videos for offline watching unless have a premium account. So, if you have the desire to download Lynda videos for free on your Windows or Mac computer, you can try Gihosoft TubeGet, a desktop Lynda video downloader that allows users to save courses from Lynda in a high quality. As this tool is integrated with a playlist downloader feature, so you are able to download multiple videos at one time in batch. Apart from Lynda, you can also use this program to download videos from all renowned video hosting websites, including YouTube, Vimeo, Metacafe, Dailymotion and many more. In addition, you can convert downloaded videos to any popular video format compatible with smartphones, tablets, social media sites, TV players and even DVD devices. Since you’ve known the basic information about this software, it’s time to see how it works on downloading Lynda videos for free on PC & Mac. 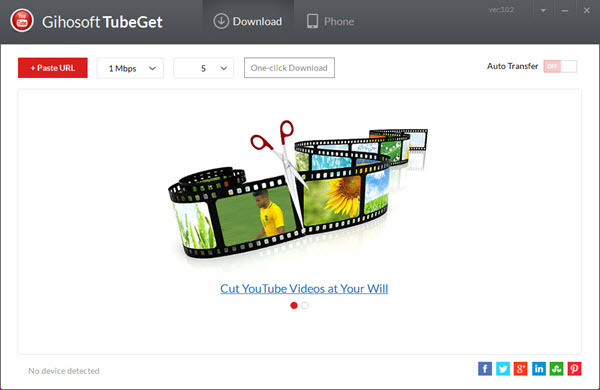 Download and install Gihosoft TubeGet on your Windows or Mac computer, and activate it. Fire up you browser and head to Lynda. Choose your desired video and then copy the link in the address bar. Once this link has been copied, launch Gihosoft TubeGet and paste the URL by clicking the “+ Paste URL” Then you will be navigated to the parameter interface. Choose the format, saving location and available resolution. Once you have selected your ideal parameter, click the download button to start the downloading process. Thanks to the modern technology that we don’t need to sit ourselves in front of a computer and watch a video. Because we can watch movies, videos or listen to music by our smartphones or tablets, and we can always keep them in our pocket. If you want to learn offline courses downloaded from Lynda, one way is to download Lynda videos through a desktop software, then transfer the videos onto your mobile smartphones. That’s a feasible way, but quite time-consuming. Now, with the right Android app – TubeMate, you can just save Lynda videos directly on your Android phones. 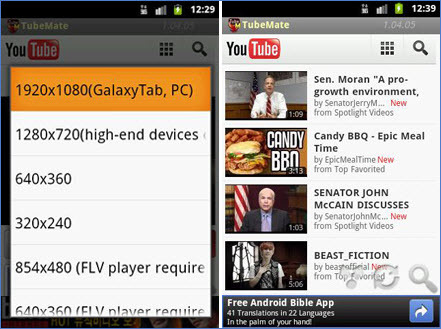 TubeMate is an Android app that provides the fastest downloading speed among all the Android video downloader. Many popular online video sites are support by this app, like YouTube, YouKu, Vimeo & Naver, and Lynda is also included. Besides, it also has the ability to save HD videos like 720P & 1080P, and UHD videos like 4k & 8K are also supported. This Android application also possible to convert your downloaded videos to MP3 or desired video formats. It also has an internal video player for watching the downloaded offline Lynda courses directly. Download and TubeMate from Android app market (Google Play is not included) and install in on your phone. After completing the installation,open TubeMate, paste the link of the Lynda video. Click the green download arrow, then a new interface will pop up prompting you to select the video format and resolution quality. Click the “Download”button, the video will be soon stored on your phone. While there are plenty of tools which promise to help you download Lynda tutorials, most of them are desktop tools. It’s workable if you use a Lynda video downloader for Windows or Mac, but first you have to download & install it on your local disk, it may take up your hard disk space. And some of them may collect your personal data and demographic details, so you have to be careful while you are using these software, because safety is the number one priority. But why wasting your energy into this, you can use an online site to do this Lynda video download work in a super easy way without further concern. Among all the online sites, Saveting is regarded as one of the most popular tools when it comes to saving videos from Lynda. What makes Saveting stand apart from other video downloader websites is that it supports download videos from many popular video hosting sites, no limited to Lynda, YouTube & Vimeo etc. Besides, the operation of this site is very easy, and it’s totally secure. Here we bring the easy-to-implement guide for you to download tutorials from Lynda on your PC, Mac, Android & IOS devices by using this online Lynda video downloader site. Head for Lynda and find the course that you want to save for offline learning. After that, play the video and copy the link lies in the address line. Simply navigate to the Saveting’s homepage on your Chrome, Firefox or any other browser. Paste the link into the box, then click the “Download”button and a list of video resolutions will be listed below. Now click the “Download”button, at that time you will be directed to a new page which contains the targeted video. Play the video, right click on your mouse in the blank area of the page, choose “Save video as”from the new pop-up interface, select the destination folder and rename the video. Finally hit the “Save” button, then the video will be saved on your computer or mobile phone. These are the 3 proved methods to download Lynda videos for free. And now I’d like to hear from you: What’s your favorite way to save videos from Lynda? Or maybe you have a question. Either way, let me know by leaving a quick comment below.